﻿ Best Price on Hostal Guatefriends in Guatemala City + Reviews! 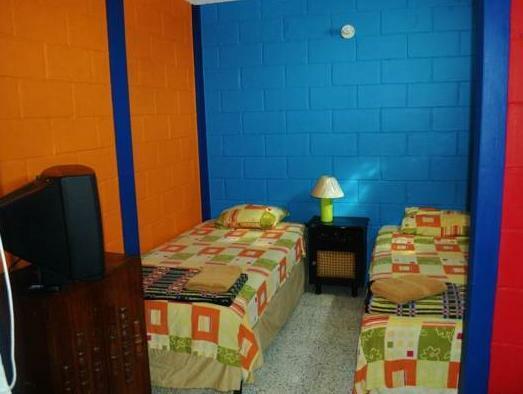 Located at 0.6 mi from Aurora International Airport, Hostal Guatefriends offer free Wi-Fi in the entire property. Breakfast is included in the room rates. The twin rooms have a private bathroom with shower and toilet, while the dormitory rooms offer shared facilities. The property has a shared dining area to guests. A variety of restaurants can be found at a distance of 1.2 mi in Zona Viva. On site, guests can find a library and a TV room with DVD player. The hostel offers airport transfers free of charge. Points of interests within 0.6 mi from Guatefriends include a zoo, a crafts market and museums. The closest subway station is 1.6 mi away, while Guatemala’s center is 6.2 mi from the property. The archaeological site of Kaminaljuyú is at a distance of 12 mi. Please note that the rates are per bed per person, not per room. Lockers are not available and bathrooms are shared. Dormitories are mixed. Guests are required to show a photo ID and credit card upon check-in. Please note that all Special Requests are subject to availability and additional charges may apply. Please inform Hostal Guatefriends of your expected arrival time in advance. You can use the Special Requests box when booking, or contact the property directly using the contact details in your confirmation.